Denis Frank Hill (No.9 in the list of male British team members) was born in Hendon, London on 17th April 1931. His first taste of roller skating came at the age on 8 when his father took him to the All Hallow's rink near Rochester. Shortly afterwards war broke out and young Hill was evacuated as were many other children in those days. Despite this, he made frequent returns at weekends which involved him going along to the local skating rink and enjoying the general sessions. By the age of 12 he was more than proficient on a pair of roller skates. His early years on skates were centred more around the dancing although he aspired to be a speed skater. Aged 14 he joined the Broadway Cricklewood roller skating club. The club took it's name from the Cricklewood Rink sited on the "Broadway" section of the A5 (otherwise known as Watling Street). Unfortunately in those days you were not allowed to compete in speed events until you was 16 years old. Hill was chomping at the bit and on 19th April 1947, just two days after his 16th birthday, he entered his first race - the Five Mile British Championship on Alexandra Palace. Later that year, on August 12th to be exact, Hill entered the NSA Invitation Half Mile Handicap at Victoria Park, Hackney. Here, aged 16, he secured a win (off 20 yards) against some stiff opposition like Billy Cook, Johnny Whatley and reigning Five Mile Champion, Stan (Jimmy) Hartigan. Hill's rise through the ranks was nothing short of meteoric. Unfortunately, in 1948, his progress was abruptly halted by a 12 month ban by the NSA handed out to both the Broadway and Birmingham clubs in their entirety. The reason for this punishment was that the two clubs had taken part in both "unofficial" British and World Championships events, not sanctioned by either the NSA or the world governing body, FIRS. Hill himself was not selected to represent Britain at the "World Championships", held in Oakland, California, but some of his team mates were - the likes of Frank Lamb (reigning NSA One Mile Champion) and Geoff Sanders (reigning NSA Half Mile Champion). Both Lamb and Sanders won medals at these Championships, with Lamb taking the gold medal in the 2 Mile event. Hill, though, did win the Five Mile "unofficial" British Championship, a trophy he still holds to this day. 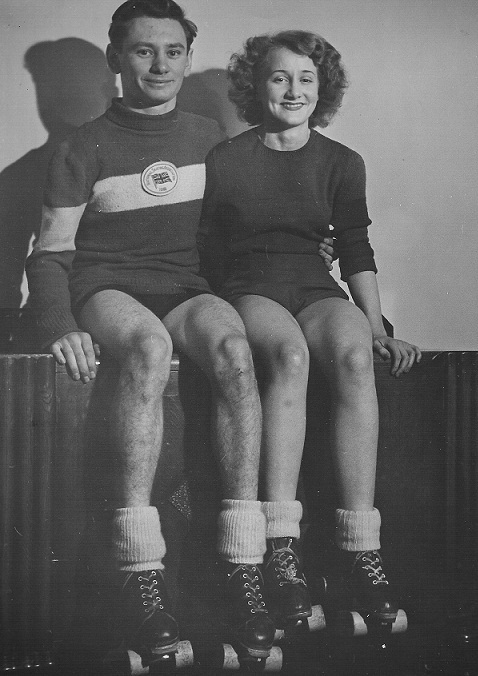 The events came about because the Cricklewood Rink and Birmingham (Embassy) Rink were owned by the same company who were themselves members of the RSROA (Roller Skating Rink Operators Association). These British rink operators were allied with similar operators in the United States, Canada, New Zealand and India. 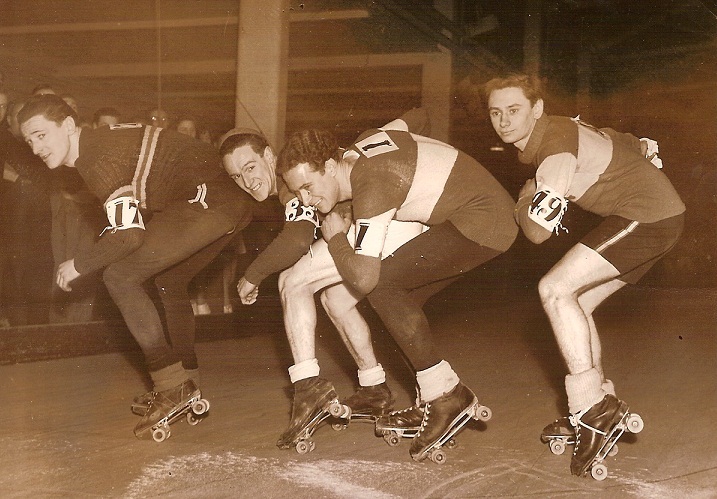 The British contingent also had their own governing body, the BFARS (British Federation of Amateur Roller Skaters). Taking part in events organised by these "governing bodies" was obviously frowned upon by the NSA and FIRS, and subsequent bans were handed out. This meant that in 1948 no Broadway or Birmingham skaters were allowed to compete in that year's "official" British Championships, and nor was any skater eligible for selection with the "official" British team. This of course included Hill. By the time 1949 came around Hill was once more raring to go. He had already made people sit up and take notice but on 22nd January he won his first British Championship medal - gold, in the One Mile Championship at Granby Halls, Leicester. The euphoria of his team mates was such that the 17 year old was hoisted aloft and "chaired" around the rink by way of celebration. By winning this event Hill had become the youngest British Champion since Jackie Robbins won both the One and Five Mile Championships in 1938. (Robbins was tragically killed in action in Iceland in his early 20's during the Second World War). Hill also went on to win the Five Mile Championship of that year at Batley and achieve second place in the Half Mile at Herne Bay - his clean sweep being prevented by team mate Don Brown. Now 18, Hill's reward for his domestic achievements was a place on the British team for the forthcoming World Road Championships in Ferrara, Italy. Alongside his Broadway club mate Don Brown and Alexandra Palace's Bob Halford, Hill took part in his first major international competition. The road was strange affair being part track and part road with two sweeping right hand bends. Hill would finish in the top ten in all four events, his highest place being 7th. "The performance of young Denis Hill in defending his title at Alexandra Palace...classifies him as 'One of the Greats'...it must also be said that the Palace representatives had the hardest of luck. Even though they may console themselves with these words, it is quite certain that none of them could have lowered Hill's colours on the day.... Denis Hill is the greatest speed skater I have ever seen - once more the Broadway have another Jackie Robbins". In December the World Track Championships were held in Lisbon, Portugal. It was here that Hill came alight. Don Brown again joined Hill, but the third skater this time was another Broadway skater, Jackie Reeves. In the four events Hill had a silver (20000m), a bronze (5000m) and two 4th places (1000m and 10000m). The 1000m was a pursuit knockout and in the semi-final Hill drew the Belgian favourite, Jos Weynen, who beat Hill by a hairs breadth. Weynen went on to win the final whilst Hill had already proved he was faster than either of the other two semi-finalists, such was the luck of the draw. Between his first British title in 1949 and his last in 1955 Hill won no fewer than eight Championships, winning at least one every year, as well as four relay titles with Broadway. He also became the first man to win the One Mile Championship in four successive years (C.J.Wilson had won it in consecutive years - 1894, 1906, 1907 and 1908). 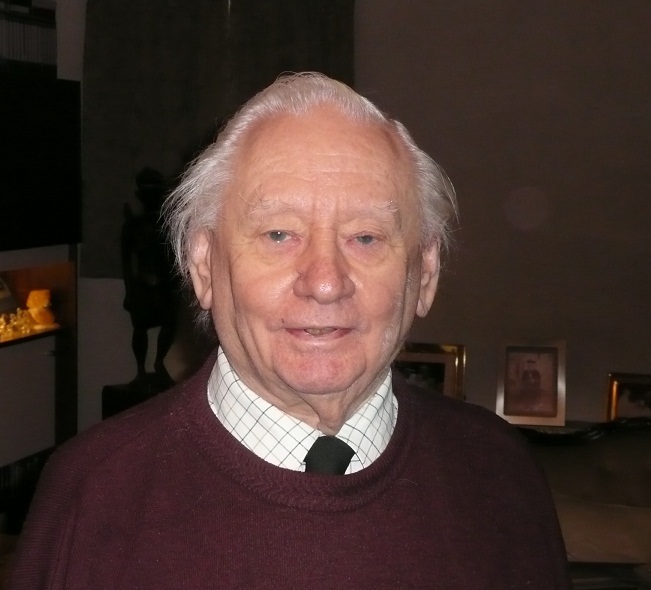 Hill's next outing in a British shirt was 1951 for the World Championships in Monfalcone, Italy, and again he would medal with a bronze in the 1000 metres. The planned 1952 World Championships in Barcelona were cancelled at short notice and Hill had to yet again miss a year in his quest to become World Champion. 1953 in Venice would again see Hill stand on the World Championship podium with a silver in the 5000 metres, but the gold medal still eluded him. In 1954 Hill won the Half Mile British Championship for the first time, but although still only 23, Hill had begun to reflect on what it was he wanted, or rather needed, from life. He had been skating since 12 years of age and on reflection his education had suffered somewhat due to his sheer dedication and passion for his chosen sport. Now it was possibly time to redress the balance which he did by attending night classes. Like many skaters, national service was also an unwelcome distraction to his skating ambitions and stationed in Norfolk it was always going to be difficult to continue his training. 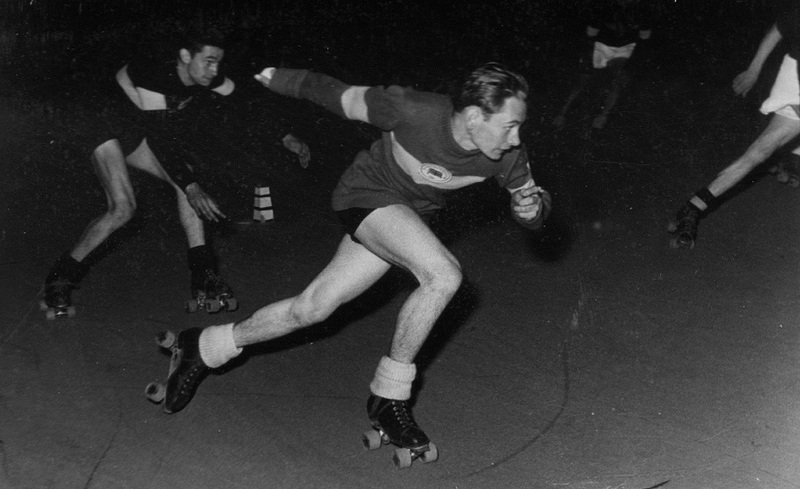 Not only that but the armed forces did not see speed skating as an 'important' sport and support for any training was difficult to obtain. Despite these setbacks, Hill married his fiancee and fellow skater, Maureen Stewart. Maureen was herself a British Champion having won the 1952 Ladies Half Mile, but whilst Denis skated for Broadway, Maureen competed for local rivals Alexandra Palace. In the October Hill had his final outing in a British shirt at the World Championships in Bari, Italy. The track was a hard small hard tiled affair and Hill was not overly keen. Not only that but his preparation by way of training and nutrition had not been ideal. Put together this all led to mediocre performances by Hill's own standards which only further fuelled his doubts about his skating future. Back home Hill still had enough class to win one more British Championship, the Half Mile at Herne Bay in 1955, but again, there were no World Championships that year. Whether Hill would have gone anyway is a question that will always remain unanswered. A year later Hill set out just one more time to retain a British title but could only manage second place behind Alexandra Palace's Charlie Applebee. It was the end of an era. The World Championships in 1956 were in Barcelona, Spain but it was a new guard that took to the track with the likes of Les Woodley, Leo Eason and Graham Stead. In 1956, at just 25 years of age the eight times British Champion and four times World medallist Denis Hill stepped off the track never to return either as an official or in management. Hill concentrated on his education, career and more importantly to him, his family. In such a short space of time Hill had achieved so much and in so doing cemented his name into the history books as on of Britain's Skating Legends.